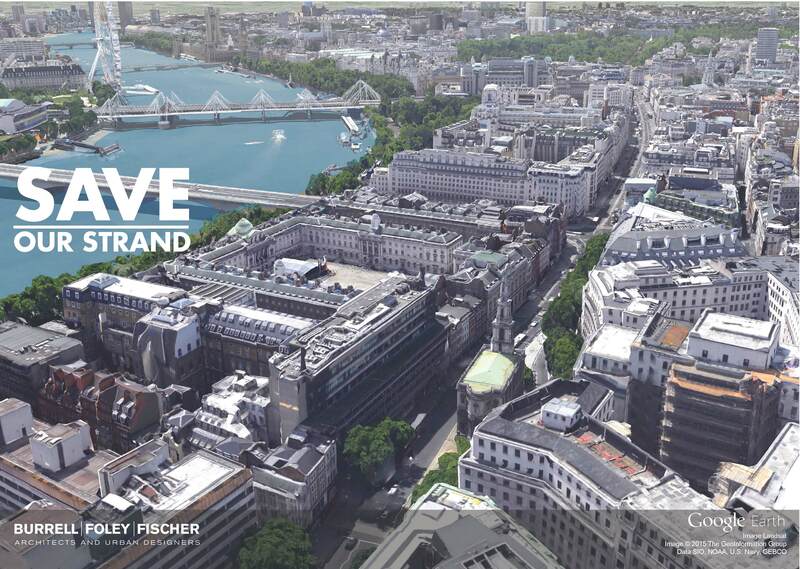 This is the draft cover of an alternative scheme SAVE is working on with John Burrell of Burrell Foley Fischer for a group of buildings on the Strand that SAVE successfully campaigned to save in March this year. This is one of the central ways that SAVE works: we come up with working, practical alternatives to the proposed scheme, that are sensitive to the built environment and aim to create places of character and atmosphere that function well. For this scheme we are demonstrating how the previously threatened buildings on the Strand can be brought back into use and all the concerns of Kings’ be addressed, and how to improve the urban space around them. Please support our scheme and make a donation towards its publication by pressing the Donate button on our homepage. Very disappointing cover. What is the message meant to be conveyed by this photo? It has a context only for people who have been involved in the process or the campaign and for most people it would only represent a picture of The Strand as it already exists. We of course want The Strand to look as it does, which was the point of the campaign, but the photo makes no statement at all. Surely something more indicative of what has happened — something that shows a via solution to what appeared to be a giant risk has been found? Dear Mr O’Brien, thanks for your message – the cover intends to put the buildings in context. We haven’t released the full set of drawings yet which will address explicitly the five buildings in question and, as you say, the giant risk that was overcome and has been addressed in the campaign so far. All best wishes, Clem. I would like to see plans for the scheme. we will send them to petitioners on completion, expected in a couple of weeks. Excellent news, a job very well done. It could be an excellent cover in due course but why release it before there is anything of substance inside it? It seems to be diverting attention away from the good news that a more sensible and viable scheme is being prepared. We are fundraising, so giving taster, to show work is in progress. Many thanks for your comment.